G.Y.M.C.L.A.S.S. is a discussion based Bible study that meets in the “gym” (Life Center) at round tables. G.Y.M.C.L.A.S.S. stands for “God, You, Me: Christian Learning And Sharing on Sunday.” An opportunity to meet a number of different people happens as the makeup of each table changes from week to week. This Bible study class are studying the book of Ruth, chapter by chapter. Next study will be the book of Esther. Lecture and discussion focus on biblical teaching and life application. 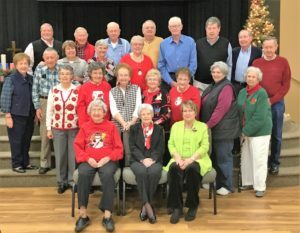 This group enjoys regular activities and gatherings with class member for even more fellowship opportunities in addition to the regular Sunday morning class. This class is led by Nell Smith and is held in the classroom located adjacent to the kitchen. This class offers a thorough study of the Bible focusing on one book at a time. The current study is the gospel of Mark and includes historical perspective and context. This class is led by Rob Smotherman and is held in the classroom located on the first floor of the education wing next to the choir room. The Barmethyan Crusaders is a discussion class taught by various class members using a variety of written as well as video resources. This class is studying I AM A CHURCH MEMBER. Visitors and new members are welcome! A verse by verse look at the Bible with probing question that draw out group discussions. Now studying the book of Acts. Aaron Boggs is the the facilitator for this group. Their classroom is located on the second floor of the education wing. Taught by Cara Blackmon in the Life Center. This class will be studying ENGAGING IN GOD’S WORD: THE BOOK OF GALATIANS. BUMS meet every month on the third Tuesday @ 12:00 noon for fun and fellowship in the Life Center or at a local restaurant. This group meets each month on a Saturday at 8:00 a.m. for devotion, breakfast and fellowship. Check with the church office @ 502-348-3209 for info on this month’s meeting. This United Methodist Women’s circle meets on the third Thursday of each month at 1:30 p.m. Members take turns hosting the meeting in their homes. Any woman is welcome to join. Nell Smith is the leader. *Does not meet during July and August.